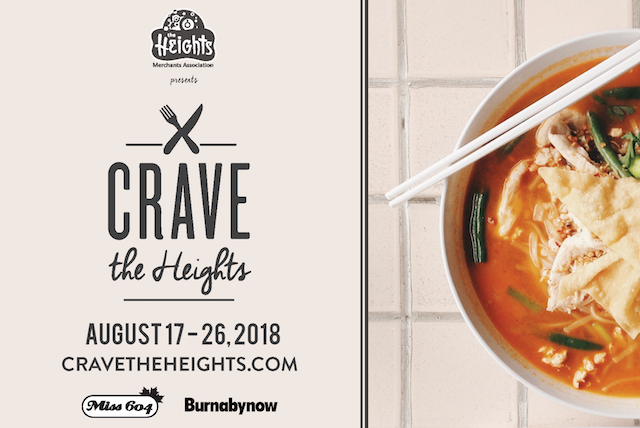 Burnaby Heights is setting up the table for this year’s Crave the Heights. From August 17-26, the Heights’ restaurants invite friends, family, and foodies to take part in a delicious neighbourhood dining showcase. Discover some of the best restaurants that Burnaby has to offer with affordable set menus, new food specials, happy hour food, and drink discounts. Alongside the participating restaurants, local Burnaby musicians, Chloe Farrell and Gabriel Hasselbach, join Crave again this year, busking on the streets of Hastings on select evenings. Call up your friends, family, or significant other for a date night during Crave. Choose from a diverse selection of three-course meals from Cristos Greek Taverna and Green & Oak Malaysian Restaurant, or get a taste of everything with five appetizer plates in The Pear Tree Restaurant’s lounge. The Heights restaurants also have Crave specials with discounts on existing menu items or brand new dishes created specifically for Crave. Whether you’re craving a southern barbeque special from Butcher’s Block, authentic Thai cuisine from Chad Thai, or a classic Reuben sandwich for lunch from The Gray Olive. There’s always room for dessert! Chez Christophe is offering a brand new Crave drink and desserts for the nine-day event, and Glenburn Soda Fountain and Confectionary introduces four new sundaes taking influence from world cuisines. With set menus, food specials, or happy hour options, there is something to satisfy everyone here on the Heights. Stay tuned for more information about this year’s participating restaurants, menus, entertainment, and prize giveaways! The Heights Merchants Association consists of more than 350 merchants and over 150 property owners along Hastings between Boundary and Gamma. Follow Burnaby Heights on Facebook, Twitter, and Instagram for more information about Crave.